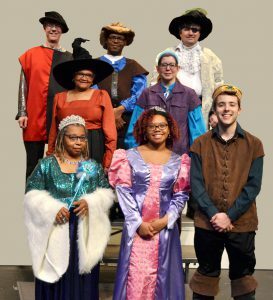 SOUTH HOLLAND, IL – The Children’s Theatre Company of South Suburban College presents Rapunzel and the Frog Prince, a uniquely comical mashup that cleverly blends the two Grimm tales into one story. Playwright Michele L. Vacca and director Ellie Shunko team up once again to turn fairy tales upside down for a spirited adventure for young and old alike. Performances will take place in the Kindig Performing Arts Center on SSC’s Main Campus on Saturdays, January 13 and 20, 2018, at 11:00 a.m. and 2:00 p.m. Additional weekday performances will take place Tuesday through Friday, January 16 through 19, 2018, at 9:45 a.m. and 11:30 a.m. each day. 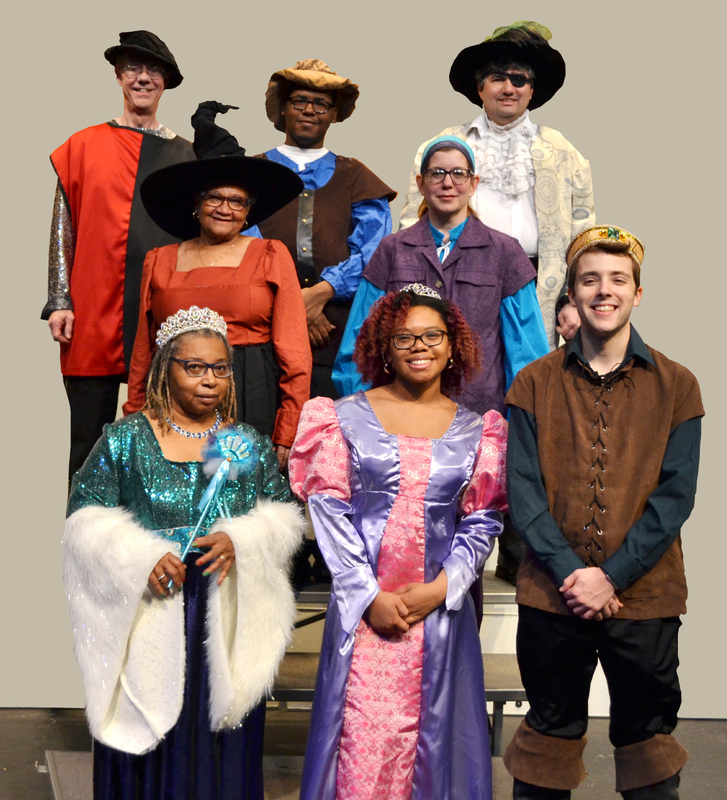 The local witch, Gruesomella Jones (Cheryle Barham of South Holland) conjures a spell that will make handsome Prince Beauregard (Zachary Scalzitti of St. John, IN) fall in love with the first woman he sees – Miss Jones herself. In walks Princess Rapunzel (Lauren Bryant of South Holland) and the Prince immediately falls head over heels for her. Annoyed by this turn of events, Gruesomella turns Beauregard into a frog so he can’t marry Princess Rapunzel. Not knowing his true identity, Rapunzel befriends the frog. Her bird-watching mother, Queen Alexandra (Betty Neil of Markham), attempts to find her daughter a proper princely husband. She calls in a series of candidates – each one more peculiar than the next – to present to Rapunzel in hopes that one will be able to replace her lost Prince Beauregard. The hopeful suitors are the ancient Prince Feeble and histrionic actor Steve Prince (both played by Pat Nevins of Homewood), the shy, clumsy Melvin Prince and the beat-boxing poet Leonardo (both played by James Hudson of Chicago), greaser wannabe Da Prince and the lunatic pirate Captain Dedalus Darkwater (both played by Paul Braun of Highland, IN). Meanwhile, back in the forest, Gruesomella and her wacky, multilingual sidekick Laguna Loxley (Juniper Boerman DeYoung of Thornton) plot to capture Rapunzel and keep her from her friend and true love. The production staff includes director and Kindig Performing Arts Center manager Ellie Shunko, a Lansing resident. The lighting designers are the husband and wife team of Lydia and Dominic Bellamy-Palma of Crestwood. Costumes are created by Joanna Tassin of Park Forest. Prop mistresses are Rochelle Walters of South Chicago Heights and Heather Young of Chicago. The sets are built by Pat Nevins of Homewood and Anne and Michael Begora of Hegewisch. Spinning tunes at the sound board will be Jordan Swierczyna of Robbins. The production stage manager is Angela Martin of Midlothian. Tickets for Rapunzel and the Frog Prince are only $5 per person. Reservations for weekday shows are suggested as some performances are sold out. For more information or to reserve tickets, call the 24/7 box office voicemail line at (708) 210-5741. Leave your name and phone number and someone will return your call. You may also reserve tickets by e-mail at boxoffice@ssc.edu.